Let’s take a look at everything about CPR: Cardiopulmonary resuscitation (CPR) is an important life-saving procedure that is performed on people who have stopped breathing and do not have a pulse. This simple procedure can mean the difference between death and survival for a cardiac arrest. The aim of CPR training is to sustain blood supply into the body’s vital organs while awaiting the arrival of the emergency services. Everything about CPR certification you need to know! Have you ever felt helpless seeing someone facing a sudden cardiac arrest right in front of you? If you had CPR knowledge, you would never feel this way. 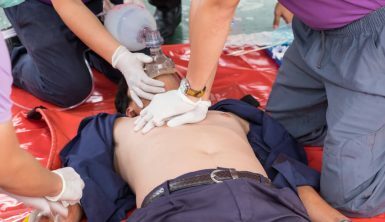 Typically, cardiopulmonary resuscitation, or CPR, involves basic chest compressions and rescue breathing techniques on a cardiac arrest victim. It is a form of first aid that is administered to a victim prior to professional medical assistance. Since dealing with a victim who is fighting for their life can be challenging, your skills and confidence as a CPR provider are instrumental in determining the victim’s survival chances. CPR, as already mentioned, stands for cardiopulmonary resuscitation. It is an emergency procedure that consists of systemic chest compressions in combination with mouth-to-mouth respiration. This combination allows oxygenated blood to circulate through the body’s vital organs such as the heart and brain. Done properly, CPR can keep a cardiac arrest victim alive while awaiting the arrival of the emergency services. This simple procedure can double the likelihood of survival following a cardiac arrest, which can occur after drowning, an electric shock, or a heart attack. Without CPR knowledge, most folks would only watch helplessly while a cardiac arrest victim succumbs. Stepping in to skillfully administer this lifesaving procedure is one of the greatest things you can do to a cardiac arrest victim during an emergency. The CPR and First Aid certifications have a 2-year validity period from the date of issue. Bloodborne Pathogens certification, on the other hand, is valid for one year from the issuance date. How to get CPR certified? Getting CPR certification is quite beneficial. CPR saves lives, and that is reason enough. Besides, CPR certification is essential in certain careers like healthcare, childcare, as well as occupational therapy, and it is an important skill to have. Even if you do not work in the healthcare industry, CPR certification can brighten your career prospects. Here is how to become CPR certified. Learn to perform compressions – This is performed to sustain blood flow through the body’s vital organs. During your CPR training, you will learn how to perform chest compressions on infants and adults. After learning how to perform chest compressions, you will learn how to clear the victim’s airways. As part of your CPR training, you will also learn how to properly administer mouth-to-mouth breathing to the victim. Expect your CPR training to take a couple of hours. Generally, it takes about 3 hours to complete a basic CPR course. However, this training may run shorter or longer depending on the class. We administer a 10 question CPR test where you must score 80% or higher to pass. During your skills check, you will be required to demonstrate your ability to perform CPR and other lifesaving maneuvers. Your CPR certification is valid for two years. Therefore, be sure to retake the course to renew your certification every two years. Mouth-to-mouth respiration was invented by Peter Safar and James Elam in 1956. It was adopted by the U.S military in 1957 to revive unresponsive victims. Cardiopulmonary resuscitation was first developed in 1960 when the American Heart Association (AHA) introduced the program to train healthcare providers in closed-chest cardiac resuscitation. To make learning CPR easy, A-B-C (A-Airway, B-Breathing, and C-Circulation) was devised. Basically, this is CPR without mouth-to-mouth respiration. It is recommended for use when an adult victim has suddenly collapsed in an “out-of-hospital” environment. Administering high-quality chest compressions with minimal interruptions. How to renew CPR certification? As already indicated, CPR certification is not valid forever. If your occupation requires you to have CPR certification, then you will need to take an exam to renew your certificate every two years. It is prudent to begin the renewal journey at least five months before the expiry of your certificate. The purpose of periodic CPR certification renewal is to ensure that you keep up with the procedure’s guidelines and standards as much as possible. Thus, when a new study recommends that the existing CPR practices require modification to improve their effectiveness, then this information is incorporated in CPR training henceforth. Such changes are usually learned during the recertification process. But what if your CPR certification is already expired? You will no longer be eligible to take a renewal CPR course if your certification is more than one month expired. Rather, you will be required to take a full certification either in-person or online before you can be recertified. The air you breathe in travels to the lungs where the blood picks up and pumps oxygen to the body’s tissues and organs. When an individual suffers from a cardiac arrest, the heart goes from the rhythmic to an arrhythmic pattern, a condition known as ventricular fibrillation. The heart eventually ceases to beat. This stops oxygen from reaching the body’s tissues and organs, resulting in tissue and cell death. Thus, cardiovascular resuscitation serves as an artificial respirator and heartbeat. While CPR may not guarantee that the victim will survive a cardiac arrest, it can increase survival chances if initiated within four minutes of a cardiac arrest. Cardiopulmonary resuscitation can help ensure blood flow to the body’s vital organs like the brain and preserve their function when the victim is unconscious and unable to breathe on their own. Through chest compressions, oxygenated blood is forced to flow from the heart to the rest of the body. Thus, when performed properly, CPR enables a cardiac arrest victim to “buy” time while awaiting the arrival of the emergency services for advanced care. As already mentioned, CPR can help those who have stopped breathing for whatever reason “buy” time while awaiting the arrival of the emergency services. CPR is basically performed to ensure sustained blood flow to the body’s vital organs like the brain, lungs, and heart. During a cardiac arrest, the heart erratically quivers and ceases its normal blood pumping. Though blood will still fill the victim’s heart, it will be unable to pump blood out to vital organs like the brain. After a couple of minutes, the heart will harden to become enlarged, making it unable to respond to a defibrillator shock. When the brain lacks oxygen for five minutes, its cells will begin to break down. The resulting damage can be irreversible. There are multiple costs associated with taking CPR training. Generally, it ranges from 16.95 to 19.95 and there are times when discounts are active. Do you want to get formal training and certification in cardiopulmonary resuscitation (CPR)? 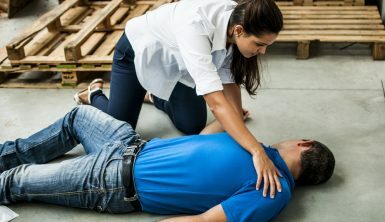 Besides boosting your career prospects, CPR skills can also come in handy when responding to emergency situations like a cardiac arrest at home or in a public place away from the hospital environment. In the U.S alone, over 900 people die per day as a result of sudden cardiac arrest. The only chance for survival during these emergencies is a quick and accurate response. CPR training and certification can transform you from a helpless bystander to a resourceful first-aider during an emergency situation. Having understood the importance of CPR, the next logical step is to sign up for the training and certification. 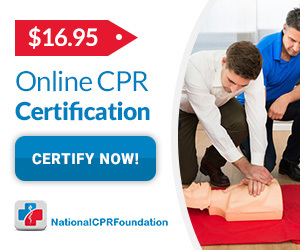 National CPR Foundation can help you get the training online from the comfort of your home. And, you will only have to pay after receiving your certificate. There is no better time like the present to get CPR certified. Sign up and start your CPR certification journey today.